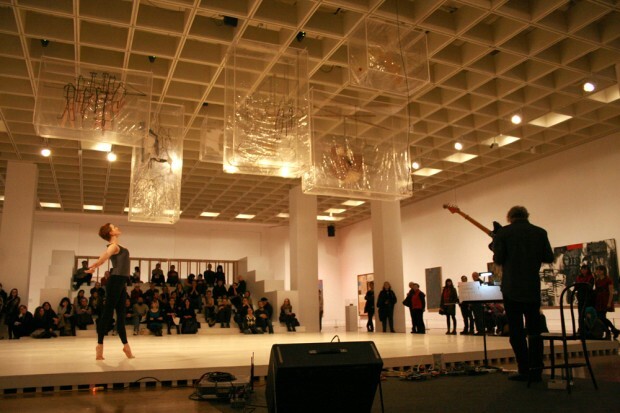 Sonic Youth’s Lee Ranaldo on John Cage, on the occasion of his performances with dancers from Merce Cunningham’s company at the Philadelphia Museum of Art, January 4,5 & 6, 2013, as part of the exhibition Dancing Around The Bride: Duchamp, Cage, Cunningham, Rauchenberg and Johns. LR: I would liken it to the one I first had when I encountered mid-century avant-garde American film: at first you don’t know what to make of it, and then you realize it’s an entirely new language that you’re trying to understand. In a sense, you have to work your way into a language, or into a new art form; it’s like coming to an understanding of abstract painting. If you’re coming from the history of popular and classical music, you’re confronted with a group of people working with a completely new set of concerns and tools. It takes a while to find your way in from the outside, and to understand the motivations and reasons why this music is being made, and how they got to this point. TK: Cage had a few things to say about a 1982 performance by Glenn Branca’s large ensemble, of which you were a part. LR: It was very controversial at the time. It was a New Music America performance that year in Chicago. The conversation went through many permutations over the years—there was a lot of back-and-forth between Glenn and John—but basically Cage was opposed to the idea of music that stems from a single, solitary leader controlling a group of musicians. He called it “fascist.” It’s completey antithetical to what he was doing, though Cage was still prescribing the roots and routines the musicians would undetake, but he was leaving so much decision-making to the musicians. Glenn’s music stemmed more from serious classical music, where it was one person’s vision and the orchestra was the tool for realizing it. It all came down to the composer, and in this case, the composer-conductor. It sparked a very interesting debate. TK: What was your opinion at the time? LR: I thought it was a matter of a misunderstanding, for the most part. It was a matter of Cage having honed a certain muscial row, and wanting to see things move more in that direction. 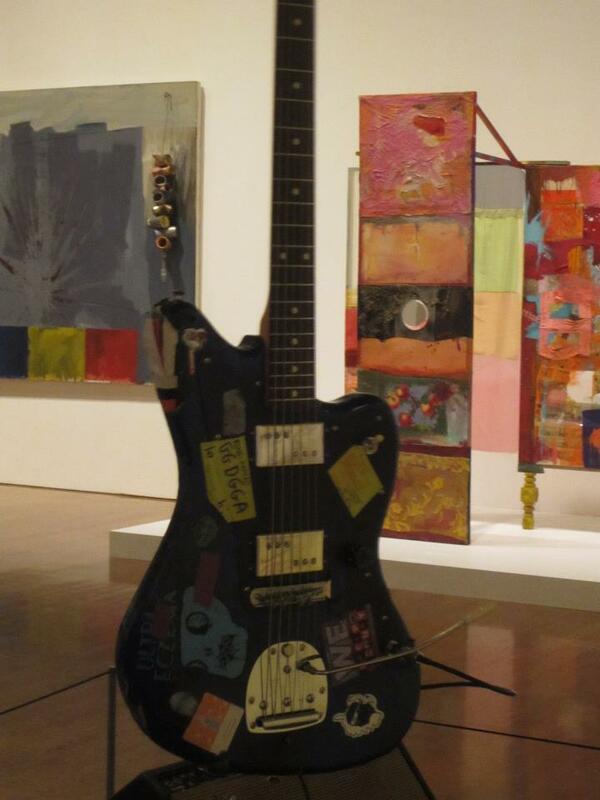 From John’s point of view, Glenn’s music was antiquated, modern and very alive with electric guitars. He thought it was a throwback to 17th or 18th century music, relying too much on a dictatorial composer. I understood his point of view, but I also knew that what Glenn was doing was something amazing. It didn’t matter to me that someone else was unhappy with it, even if that person was John Cage. TK: In your career, you’ve managed to navigate both of these worlds: performing more composed, popular pieces with Sonic Youth and on your most recent solo album, and doing improvised engagements with other projects grounded more on the agency of the performer. LR: Definitely. I’ve tried to keep a foot in both worlds. For a modern musician, it’s something you have to understand—you have to know both sides of the coin. If you want to be a composer, or a singer-songwriter, or anything like that, you’re working in a very traditional form that revolves around set pieces of music that are going to be played over and over again in a specific way. You have to accept that as soon as you enter that world. If you grow up in the modern world, and you have an interest in abstraction—whether coming from 20th century classical music, or free jazz, or 60s psychedelia, or free noise—you also have an understanding of where that music’s coming from. In my career, I’ve been lucky enough to exist in a period of time where I didn’t have to eliminate one side of the coin in favor of the other. TK: Do you have a favorite Cage piece? LR: I’m not sure. That’s a complicated question when it comes to Cage. Sonic Youth played some Cage pieces back when we were doing the Goodbye 20th Century record, so I have a fondness for those pieces. And then there are others, like “Water Walk,” which was a very comical piece that he performed on a television show. It’s a favorite just because he’s kinda poking fun at the idea of modern music. It’s a very serious piece on his part, but he knew that it would get a particular type of reaction, and it highlights his showmanship. And then there are the “Rainforest” pieces, which are the ones that I first came to. I love those because they encompass so much, and are open to so many different aspects of Cage’s work. TK: I suppose liking a Cage piece has more to do with the ideas expressed, or what it allows the performer to do, rather than how it sounds. LR: Yes, liking a piece would have to do with a composer’s intention, and the idea behind the piece. That’s a big part of his compositional style: we’re not working with melodies here, we’re working with ideas. So it’s interesting to watch his ideas progress over the course of his career. I actually really love the early pieces for metal, the percussion pieces from the early collection of his Town Hall concert. He was using brake drums and other found metal objects, and ended up creating something that sounded like Balinese gamelan. TK: What’s your plan for these upcoming performances in Philadelphia? LR: I think I’ll be mostly utilizing Cage’s work. The thing about his work is that every musician brings to it his own vocabulary. I’ll be using my style, but playing with his structural ideas. I’m still working through a possible list I’m going to work with. I’m going to do some vocal pieces, and a lot of muscial pieces. TK: How do you prepare for something like this? LR: It’s really all about finding the scores, and looking over them in order to get an idea of what’s expected of the musician. It’s not really preparing in the sense of how I’m gonna tune the guitar, or what I’m going to do with my fingers. It’s more about being knowledgeable of the scores. TK: What’s the most valuable lesson you’ve learned from Cage’s work? LR: He made this statement once, or I read it somewhere, but someone was asking him about records, and asking him if he listened to his own compositions or what records he liked to listen to in general. What he said struck me as very interesting, and over the years it has become second nature; it’s something I ponder a lot. He said he never felt the urge to listen to a record more than once. He’d give it his attention, and listen to it, and he’d never really need that same experience again. It’s a telling quote, and it’s the very reason why he acted the way he did toward Glenn’s music, and why he wasn’t involved in anything you could label pop. Pop gets stuck in your head, and it’s something you want to listen to 50 times in a row. His music was all about variation and change–he was randomizing as many components as he could. It wasn’t in his interest to listen to something many times because he wanted everything to sound radically different every time. Musicians love his scores so much because you can interpret them any way that you want. You can ignore them, you can adhere to them, it’s all good. And the second part of what he said was that he’d rather just open his window and let the sounds come in than listen to recorded music. This is really Cage’s music in a nutshell, and obviously points to his famous piece “4’33″.” It’s the basis of all his music. He was trying to approach the random qualities of the natural world–or the world we live in, whether natural or not–through music. He wanted it to be of that same spirit, if not the same thing. The composer’s hand is at its most minimal. What is the composer doing when the composer is hardly doing anything? It’s like a Zen poem. 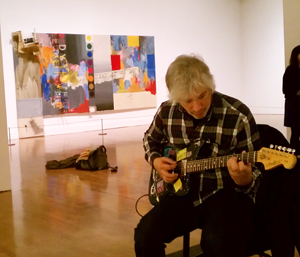 Lee Ranaldo plays the Philadelphia Museum of Art on Friday, January 4 (4:30 – 7 p.m.), Saturday, January 5 (1 – 3 p.m.), and Sunday, January 6 (1 – 4 p.m.). 122212 | Filed under INTERVIEWS. I remember seeing John Cage at College-in-the-Woods in Binghamton in the mid-70’s. I’d be surprised if Lee wasn’t there, as well.